WASHINGTON - American astronomer Edwin Powell Hubble, who revolutionized humanitys concept of the universe, will be honored April 10 when five new commemorative postage stamps are issued by the U.S. Postal Service at the NASA Goddard Space Flight Center in Greenbelt, Md. The Edwin Powell Hubble stamps will be issued in conjunction with Goddard Space Flight Centers 10th anniversary celebration of the launching of the Hubble Space Telescope. The event begins at 9 a.m., with the stamp dedication taking place between 10:30 and 11:00 a.m. Due to seating and security considerations, the event is by invitation only. Stamp collectors are invited to visit the Goddard Visitor Center, where the first day of issue ceremony will be broadcast live on monitors in the center. Ceremony programs, sales of the stamps and first day of issue cancellations will also be available at the center. The stamps go on sale that day at post offices nationwide, with Greenbelt serving as the official first day of issue city. 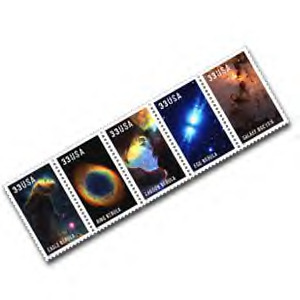 The stamps will also be celebrated at an event in Pasadena, Calif. "The Edwin Powell Hubble stamps bring the farthest reaches of the universe to our fingertips," said Postmaster General William Henderson, who will dedicate the stamps. "We will forever be indebted to this great astronomer for his groundbreaking work in opening up the wonder and majesty of the heavens." Also expected to participate in the stamp dedication ceremony are Daniel S. Goldin, Adminstrator of NASA, and Sen. Barbara A. Mikulski, D-Md. Edwin Powell Hubble was an eminent American astronomer whose observations at the Mt. Wilson Observatory (near Pasadena, Calif., and operated by the Carnegie Institution of Washington) revolutionized the study of the universe. Born Nov. 20, 1889, in Marshfield, Mo., Hubble determined that galaxies exist outside of and are receding from our own galaxy, the Milky Way. His observations demonstrated that the universe is expanding. Hubble died Sept. 28, 1953, in San Marino, Calif.
NASAs Hubble Space Telescope (HST), launched in April 1990, orbits the Earth and sends astronomical data back to scientists. The HST can see the universe more clearly than Earth-based observation tools and provides astronomers with stunning images. The five stamp images Eagle Nebula, Ring Nebula, Lagoon Nebula, Egg Nebula and Galaxy NGC 1316were captured by the HST. The images are visual representations of data taken by the HST that have been processed, and in some cases colorized, for scientific purposes. A 1949 black-and-white photograph of Hubble, posing with the 48-inch Schmidt Telescope at Palomar Observatory, serves as the selvage image. Phil Jordan of Falls Church, Va., designed the stamps and stamp pane. Also included on the stamp pane is a message inviting the public to World Stamp Expo 2000, which will be held July 716, 2000, in Anaheim, Calif. The space stamp theme will continue at World Stamp Expo with the issuance of the Space Achievement and Exploration stamps and four youth-designed Stampin The Future stamps. Among the Space Achievement designs are the nations first hologram stamps, the first circular stamp and the first pentagonal stamps.